J. Epstein, 1950's; Dr I. Epstein; Dr M. Evans. R. Buckle, Jacob Epstein Sculptor, London, 1963, pp. 210-11, pl. 323, another cast illustrated. E. Silber, The Sculpture of Jacob Epstein, Oxford, 1986, p. 178, no. 253, another cast illustrated. 'The Holland-American liner, Rotterdam, sailed into New York harbour in a dense fog. It hit a fishing smack. The New York Times noted this fact. It added, 'aboard the liner, due to dock in Hoboken tomorrow, is the noted New York born sculptor Jacob Epstein'. I hasten to add that nobody was injured in the incident. We borrowed a family car and took the Hoboken ferry to New Jersey. Driving to the pier we arrived just in time to see the passengers disembarking down a long wooden gangplank. There, ambling down in his own characteristic gate, was our quarry. Jacob bore an uncanny resemblance to my dad. Indeed all seven siblings of that generation, both male and female, shared a physiognomy and mannerisms that were identifiable. Only Jacob's speech pattern was unique. It was an amalgam of his lower East-side New York accent and the King's English of London's cultural elite. Always gallant and never at a loss for words, Jacob greeted his younger brother, Irving, 'Thank God you're here. I would have had to sleep in Central Park tonight'. Actually he had a hotel room booked. That night he put his shoes outside to be polished. They were swiped and so he returned, with his brother in tow, to live with us. Our home became his permanent address in America for all subsequent visits. Happily my dad suggested that we become Jacob's unofficial agents in the U.S., insisting at the same time that we exact no commissions and charge no expenses. Thus, a marvelous relationshipwas establishes with the artist and his entire English family. Epstein's greatest portraits often resulted from his interaction with very talented sitters. He doted on his children and grandchildren, also producing memorable portraits. A third category that deserves mention were the beautiful, intriguing and always intelligent women. 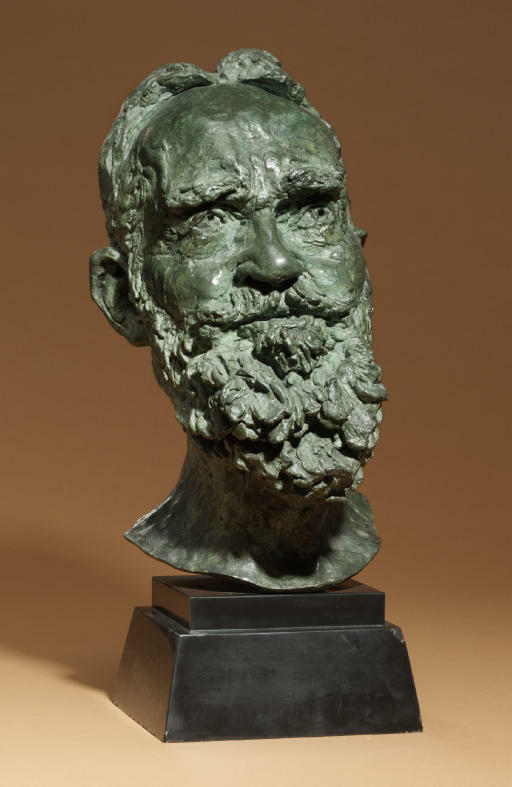 George Bernard Shaw is a prime example of this first category (see lot 137). He understood Epstein better than most. A most inciteful and amusing description of his sitting is described in Hesketh Pearson's biography of Shaw. Shaw recalls that 'I sit patiently and you do exactly what you want to do, which is, to strip from me the mask of civilisation. Then you went on to perform marvels of modelling on lips and cheeks and mouth with all the mastery that makes the busts precious' (see H. Pearson, A Full Length Portrait and A Postscript, New York, 1963, pp. 274-5). We must note that Kitty, one of Jacob's three daughters, met all three criteria for a perfect sitter (see lot 139). I first met her at a most difficult time in her life. A recent divorce from the painter, Lucian Freud, could not quench her great spirit. In 1987 when we next met she was married to a wonderful man, Wynne Godley, a professor of economics at Cambridge University. Epstein's St Michael Slaying the Devil, on the façade of the new Coventry Cathedral, incorporates Godley's head as that of St Michael. We met Kitty and Wynne Godley at the Leeds City Centre hotel. We had come up to Leeds from London to attend the 1987 retrospective exhibition 'Jacob Epstein: Sculpture and Drawings'. In his will, Henry Moore requested that after his death an Epstein retrospective be held at the Henry Moore Centre for study of Sculpture at Leeds City Art Galleries. This show was to honour his friend Jacob Epstein, one of his earliest benefactors and collectors of his work. What a magnificent and magnanimous gesture this was. The obituary written by Moore on Jacob's passing is a treasured testament in our family's archives. Kitty Godley opened the festivities with a gracious speech attended by donors to the exhibition, dignitaries in government and the art world, family and a marvellous selection of Epstein loyalists. It was presided over by the foremost living historians of Epstein: Evelyn Silber; aided by Terry Friedman and the entire Foundation Staff; critiqued by Richard Cork, and next brought to London's Whitechapel Gallery by none other than Nicholas Serota. It must be noted that Sir Nicholas has gone on to assemble an unsurpassed collection of Epstein's work at the Tate, London. This event completed a circle of relationships between Epstein and Moore which is most profound. It anchors the two men in their positions as masters of 20th Century British sculpture' (private correspondence, 2007).